While this section may present more technical "Under The Hood" information than the typical artist will need, or even want, to learn, it genuinely pays to have at least a basic understanding of how an Asset functions. Plumber is an Asset-based production system, which means that every 3D element used on a project is more than merely a Maya object within the scene file. The objects exist within a unique data structure and have certain characteristics that provide significant flexibility in their use. For example, after an Asset has been used thoughout 20 shots, the Asset can be edited and the 20 shots will automatically have the newly revised version. Plumber provides of all the tools to create and manage Assets within your show, but it is important to learn how Assets work and what different options are available in order to use them effectively. Below is information regarding the data structure tree of Assets, the different elements of an individual Asset, what Asset workflows are available within the Plumber system, and what Asset Types are available. The top level of an Asset is the Asset Placeholder. This is essentially the container for all the parts of an Asset. When you use the Create Asset feature in the Asset Editor, you are creating a Placeholder. Underneath the Asset Placeholder is the Level of Detail. There can an unlimited number of LODs, but there must be at least one. While LODs are completely unconnected to the Componenets of other LODs, they are both part of the same Asset. LODs can be used for different versions of the same Asset that can be switched back and forth at will. Here's an example. . . In your show a character is going to be wearing a raincoat in one scene, and a tuxedo in another. Three LODs are created -- Lite, Raincoat and Tuxedo -- with Lite being an extremely Low res version for quick animation. All of the production work can be done with the Lite LOD. Then when it is time for lighting, the switch is made to the proper LOD -- Tuxedo or Suit. 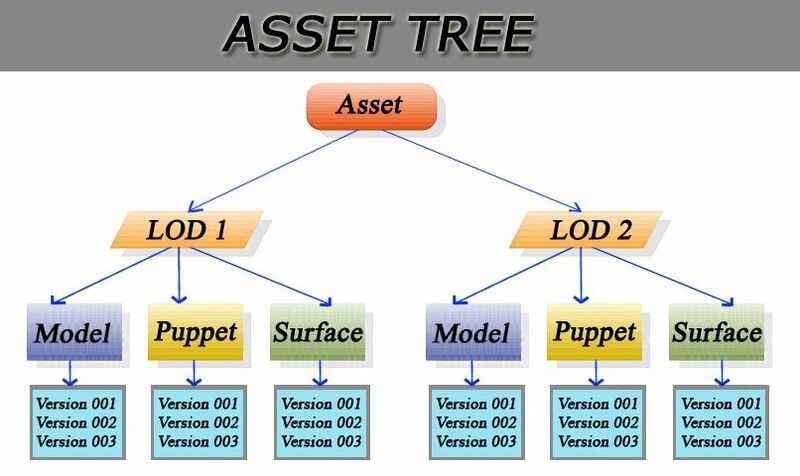 Within each LOD are the Asset Components -- Model, Puppet and Surface. There can be very close relationships between the components depending on the Asset Workflow chosen in Preferences (See Workflows for more details), but the components of one LOD are completely unrelated to the components of another. Finally, within each Component is a series of incrementally saved Versions of that component. The Asset Workflow determines both the order in which Asset Components are created, and the relationships/inheritance schemes the three Components have with each other. There are two general types of Workflow -- Linear and Parallel -- with several internal variations. These workflows are determined by the Assets Preferences set in the Preference Editor. The Flow Type determines the order of Component creation. Whatever the Workflow choice, the intial Component created for every Asset must be the Model Component. Linear Flow - In a Linear Flow, each of the Components feed into each other like an assembly line. In the first entry in the Asset Workflow image above, the Model is created first. It is then used to produce the Surface, which is then used to make the Puppet. 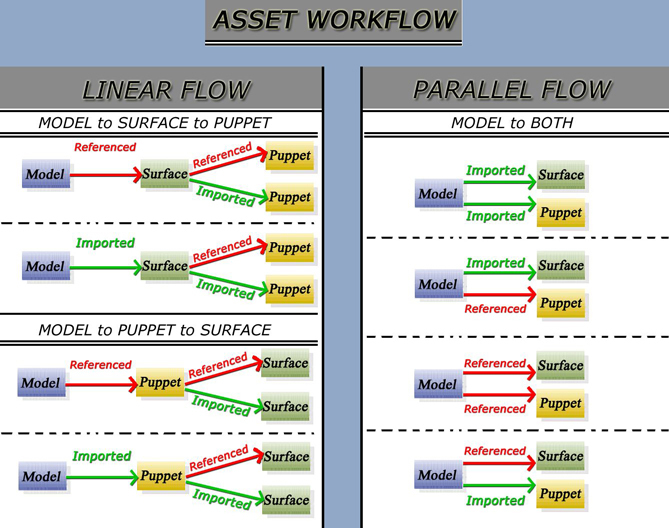 Parallel Flow - In a Parallel workflow, the Puppet and the Surface are not interconnected, and are created in parallel from the Model Component. Since the Puppet cannot drive the deformations of the Surface Component, tools or additions to the User Def scripts will need to be put in place for this Workflow to be used. Many rendering pipelines function this way. Another consideration in determining Workflow is the type of connections between each of the Components. For example, in a Linear Flow the Puppet can flow from the Model or the Surface. If the flow has been determine to be Model-> Puppet-> Surface, the Puppet can either be made by Referencing the Model, or Importing it. Additionally, the Surface can either Reference or Import the Puppet. Referencing or Importing is an important decision to make early, and there are pros and cons to each. Referenced Connection - A Referenced connection ensures that ANY changes in the Parent Component will be automatically sent across to be picked by the Child Component. Please note that this does not mean that a change to a Model Component will automatically be picked up by the Puppet in Production Shots. As a safeguard, any time a change is made to a Component, new Versions of the Child Components must be made. If we go back to our Model-> Puppet-> Surface example, if the connections are References, then a change to the Model will be picked up automatically the next time the Puppet Component is edited. BENEFIT - Changes get automatically picked up downstream, which may prevent the Child Component from being remade from scratch. Imported Connection - With an Imported connection, after a Child Component is Initiated (created for the first time), the connection between Components is severed. If a change is made to the Parent Component, the Child will need to be completely remade. Since there is no connection, however, many potential headaches due to Referencing will go away. For example, if a Model Component is being Referenced to create the Surface, editing Surface UVs can cause problems -- especially if there is a construction history. With Importing, you can make ANY changes to the Child Component without any limitations. BENEFIT - No problems with History. Any edits can ALWAYS be made to Child Components. NEGATIVE - If any change has been made to a Parent Component, all of the Child Components must be remade. The Workflow choice should be made at the beginning of the production of a Show. While Referencing offers some benefits, there are some risks as well. A mix of Referencing and Importing might work best. The overall recommendation is that Importing is Safer from the standpoint that you always know that Child Components will need to be updated. With Referencing, a five minute task may suddenly take hours to complete due to problems with History, and such. Each LOD is made up of the three Asset Components -- Model, Puppet and Surface. While they may be deeply or loosely interrelated, the initial Component must always be a Model. Each Component can only exist as a single hierarchy. In other words, when a Model is Committed (a Plumber complient form of saving) only a single Maya hierarchy is Committed. The same is true of all of the other Components, so that despite there being 3 individual Components, there is only one tree. Model - The initial Component. This serves as the Parent Component to the others, no matter which Workflow you choose. Outside of the Asset Editor, this Component is never directly used. If you are Referencing in the Model to create the Surface, it is best to organize your UVs in the Model instead of the Surface. Puppet - This is the essentially the Component that is brought in when an Asset is added to a Maya session via the Asset Library. In actuality, the Asset Library references a special version of Puppet Component called the Prod Puppet. The Prod Puppet is automatically created whenever a Puppet Component is Versioned. It is a version of the Puppet Component with all references imported. The Prod Puppet has all of the same functionality of the standard Puppet, but all of the connections to the other Components are gone. Note, however, that when you edit the Puppet in the Asset Editor you will always be editing the Puppet, not Prod Puppet. The Referenced connections are always available for the Puppet. They are merely diconnected from the Prod Puppet. Surface - The Surface Component is the Component with shaders, textures and other render-related attributes. The Surface is brought into a Maya session by using the Asset Spreadsheet to switch out the Puppet to the Surface. Just like the Puppet has a Prod Puppet, the Surface component has a Prod Surface. The Prod Surface has all of the same functionality of the standard Surface, but all of the connections to the other Components are gone. Note, however, that the Referenced connections for a Surface are always included when editing the Surface in the Asset Editor. They are merely disconnected from the Prod Surface. While there are Char, Effect, Envir, Prop and Set Asset Types, they are all the same except for Set Assets. Most of the types are only used to help organize your Asset Library, and are in fact no different from the other Types. Set Assets, however, are unique from the stand point that they are a collection of other Assets, and exist only in Puppet form. The Set Asset Type is an efficient way to bring in groups of Assets that will be used together repeatedly in a consistent position relative to each other. For example, if a Set Asset is created for the interior of aDiner, then the Diner_Int Asset can be created with all of the tables, chairs, plates, forks, salt shakers, etc. In each production shot, only the Set Asset needs to be brought in, not the individual elements. Additionally, if a Set Asset is being used and one of the booths in the Diner_Int is shifted in the Set Asset, then every shot using the Diner_Int will have the newly changed position automatically. A Set Asset can even be made up of other Set Assets. This is a very powerful Asset Type for many reasons. See the Tips section for more uses of Set Assets.